One of the most magnificent examples of the architectural style known in Italian as stile liberty, the Municipal Casinò at San Pellegrino Terme is now available as a venue for weddings and conventions. Both the impressive exterior and ornate interior of the building in Via Bartolomeo Villa have been carefully restored, taking it back to the elegance and sophistication of the glorious days early in the 20th century when it was fashionable for the rich and glamorous to visit San Pellegrino. The spa town’s Casinò took just 20 months to build between 1905 and 1907 and is generally regarded as a masterpiece of Stile Liberty, or Art Nouveau, as it is also known. Illustrious guests visiting San Pellegrino Terme to take the waters would come to the Casinò to hear musical concerts or gamble in the Sala da Gioco (gaming room). It became a meeting place for the most eminent people from the worlds of finance and politics as well as the aristocracy. The gaming room was closed on Mussolini’s orders in 1926 and reopened, for a brief period only, in 1946. Nowadays under Italian law, gambling is permitted in a few places only, the most famous being the Casinò in Venice. 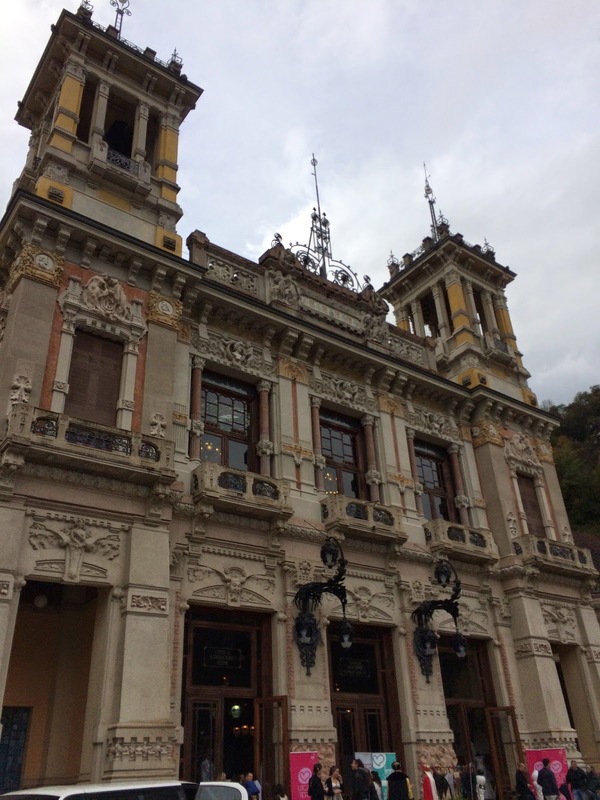 San Pellegrino Terme and the province of Bergamo are now working in partnership to revive tourism in the town and the restoration of the Casinò and adjacent theatre were the first projects undertaken. There are also plans for a new Spa centre and for the restoration of the Grand Hotel. The Casinò now provides a prestigious venue for weddings, meetings and conventions. For more information about arranging an event there, visit www.casinosanpellegrinoterme.com. Guided tours of the Casinò can be booked with Bergamo Su e Giù, who are a small group of dedicated tour guides committed to promoting the unique heritage of Bergamo and the surrounding area. They formed their association to provide services for tourists five years ago and can provide tours with commentary in English, French, German, Spanish, Russian and Japanese for groups from as few as six, to around 30 people. Bergamo Su e Giù, which literally means 'Bergamo up and down', have taken more than 600 visitors round the Casinò since it reopened. For more information, visit www.visitbergamo.info. The name San Pellegrino has become synonymous throughout the world with the bottled aqua minerale that comes from the town. But since medieval times San Pellegrino Terme, which is about 24 kilometres north of Bergamo in the Valle Brembana, has been a place people visited hoping for a cure for their illnesses. The waters were believed to be particularly effective against uric acid and kidney stones. San Pellegrino became fashionable at the end of the 19th century and impressive buildings such as the Grand Hotel, il Palazzo della Fonte and il Casinò Municipale were designed for the town by architect Romolo Squadrelli. It is worth a visit, by car or bus from Bergamo , to see the opulent architecture and to take a stroll along the banks of the River Brembo, where you can imagine what San Pellegrino would have been like at the height of its popularity. But wherever you decide to stop for refreshment, make sure you order a bottle of San Pellegrino!